There are over 74 characters in Super Smash Bros. Ultimate. And each fighter from the roster that was present in Super Smash Bros. for Wii U & 3DS received a amiibo figurine which were used to create Figure Players (FP’s). Nintendo has previously stated that each fighter currently without an amiibo will receive a figurine some time in the future. For those starting from scratch, that is over 74 amiibo to collect! For a very exclusive group of buyers though, Amazon Japan will be able to help gamers build their Nintendo collection with a massive Super Smash Bros. Ultimate Limited Edition amiibo Box Set! 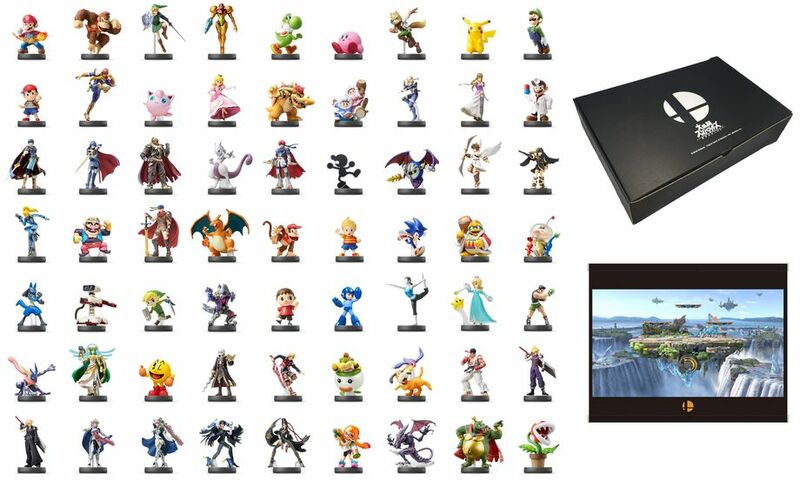 This incredibly expansive box set includes all 63 previously released amiibo. However, according to reports, only 50 of these boxes will be up for sale. Talk about being part of an exclusive group! From the looks of the product page, this also appears to be a deal that’s a part of Amazon Japan’s Cyber Monday sales. This box set will include the new amiibo that are being released alongside Super Smash Bros. Ultimate on December 7th, including Ridley, Inkling Girl, and Wolf. Additionally, according to the image, the box set will also includes King K. Rool, the Ice Climbers, and Piranha Plant. This limited edition set includes a beautiful storage case for the amiibo, as well as a wall scroll depicting the Battlefield stage. Amazon hasn’t yet said when these extensive box sets will ship. There has been no activity outside of Amazon Japan, so there is no word if this box set come to other regions or in greater quantities. You can find the product page for the Super Smash Bros. Ultimate Limited Edition amiibo Box Set right here. What do you guys think of this box set? Would you be willing to buy it? Let us know in the comments below!